A doctor, a pharmaceutical assistant and a police officer die after a gunman opens fire. A doctor, a newly graduated pharmacist and a police officer were killed after a gunman opened fire at a hospital in Chicago, police say. The gunman was seen arguing with the doctor, Tamara O'Neal, who he had been in a relationship with, before shooting her and turning his gun on others. The shooter, who has not been named, also died but it is not clear if he was killed by police or took his own life. 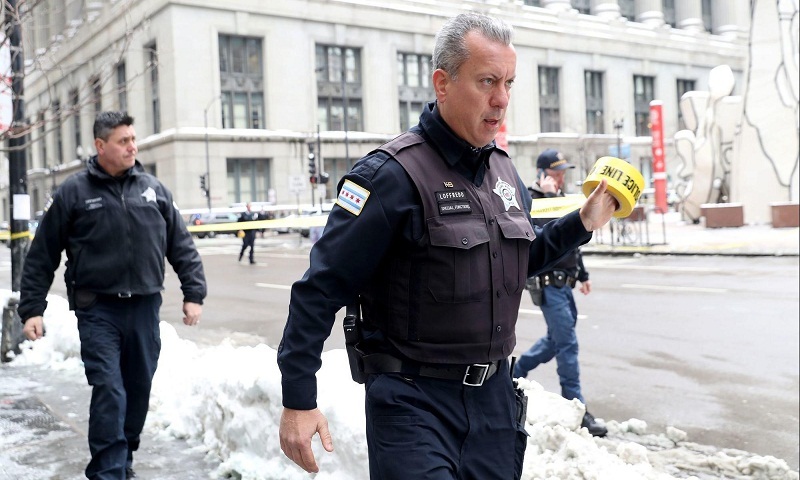 Mayor Rahm Emanuel said the attack "tears at the soul of our city". "It is the face and a consequence of evil," he said, adding that the three victims were "all going about their day, all doing what they loved". The shootings began with a row in the Mercy Hospital car park between the gunman and Ms O'Neal at about 15:00 local time (21:00 GMT) on Monday. When a friend of the doctor's tried to intervene "the offender lifted up his shirt and displayed a handgun," Chicago Police Superintendent Eddie Johnson said. As the friend ran for help, gunfire broke out, according to the Associated Press. One witness, James Gray, told reporters he saw Ms O'Neal fall to the ground and then the gunman "stood over her and shot her three more times". When police arrived, the gunman then moved into the hospital - shooting at random and killing pharmacist Dayna Less who was getting off an escalator at the time. In an exchange of fire with the gunman, police officer Samuel Jimenez was killed. A second police officer avoided injury after a bullet fired in his direction became lodged in his gun in his holster. What more do we know of the victims? Tamara O'Neal was an emergency physician at Mercy Hospital on Chicago's South Side. Dr Patrick Connor, director of the hospital's emergency department, said she had been "dedicated to caring for her community - a wonderful individual". Police said the gunman had been in a domestic relationship with Ms O'Neal and media reports say he was her ex-fiance but this has not been confirmed. Dr Connor also paid tribute to 25-year-ld Dayna Less, saying she had joined the hospital in July as a first year pharmacy resident and was a recent graduate of Purdue University. Police officer Samuel Jimenez was a 28-year-old married father. "We cannot thank him enough for his courage and bravery today," Dr Connor said. How big a problem is gun violence in America? US medical professionals recently became involved in an online campaign protesting against gun violence. The hashtag #ThisIsOurLane was used by doctors in response to a tweet from America's powerful pro-gun group, the National Rifle Association (NRA), that suggested anti-gun doctors should "stay in their lane" after high-profile shootings. Some doctors rebuked the assertion - sharing emotional stories and blood-splattered photographs of their treatment of gun violence victims.